Composer/Sound Artist Howard Sandroff's concert works, written for soloists, mixed chamber ensembles and orchestra, often include live or pre-recorded electronics and have been performed, recorded and broadcast throughout North and South America, Europe, Asia and Australia. Sandroff's compositions have been heard at numerous contemporary music festivals including New Music America, the Society of Composers, the Aspen Music Festival, New Music Chicago, the International Computer Music Conference, the International Society of Electronic Arts, the Smithsonian Institute, the World Saxophone Congress in Japan and France, the International Clarinet Society in Quebec and Paris, Vermont New Music Ensemble, Chicago Symphony Orchestra Chamber Music Series, the Musik Factory in Bergen, Norway and many others. In June 1996, Sandroff was invited by Maestro Pierre Boulez to attend the dedication of the new I.R.C.A.M. facilities at the Georges Pompidou Center in Paris where Alain Damiens, soloist with the Ensemble Intercontemporain, performed Sandroff's 1990 composition, Tephillah: for clarinet and computer. In October 1999, he was featured composer at the Ultima Festival in Oslo, Norway and was the subject of a 90 minute broadcast on WNIB Radio Chicago in honor of his 50th birthday. On March 22, 2000, the Chicago Pro Musica will perform a retrospective of Sandroff's chamber works at Chicago's Symphony Center celebrating the composer's 50th birthday. Among Sandroff's most recent works are "The Bride's Complaint" commissioned by Soprano Susan Charles and recorded for a 2000 release from the Electronic Music Foundation. "Concerto for Electronic Wind Instrument and Strings" commissioned by saxophonist Frederick Hemke, received its premiere with the Tokyo Metropolitan Orchestra. "Tephillah" for Clarinet and Computer Controlled Audio Processors was commissioned by Yamaha Corporation of America for Chicago Symphony clarinetist, John Bruce Yeh. Yeh has recorded the work for Koch International Classics (KOCH3-7088-2 H1), released December 1997. Tephillah has also been recorded by Alain Damiens, principal clarinetist of the Ensemble Intercontemporaign and released in July 99 on Virgin Classics� "American Clarinet" (VC 5 45351 2). "Eulogy " for solo saxophone was commissioned by the Japan Saxophonist Association and is published by Editions Henry Lemoine, Paris and was recorded by Saxophonist Paul Bro for a November 98 release from Arizona University Recordings (Aur CD 30630. "Chorale for Saxophone Quartet" was commissioned and premiered by the Chicago Saxophone Quartet in May 1994 and the musical score to "A Child's Journey Through Auschwitz", a documentary film by Michael Rabiger was completed and recorded in June 1995. "La Joie" for clarinet trio, was commissioned and premiered in Paris by The Chicago Clarinet Trio (Chicago Symphony clarinetists John Bruce Yeh and Larry Combs and Depaul University School of Music clarinet professor, Julie De Roche) in July 1996. Eulogy is published by Editions Henry LeMoine, Paris and was recorded by The Chicago Clarinet Trio on Helicon Records (HE 1028) which was released in August 98. "Chant de Femmes" for flutes and electronic sounds commissioned and premiered by flautist Mary Stolper in 1996 and is scheduled for release on Compact Disc by the Electronic Music Foundation. Two of his piano works, "Adagio" (1984) and"...there is a decided lack of enthusiasm at my end of the leash." (1981) for two pianos and electronic sound are available on Centaur Records (CRC 2082). In addition to his work as a composer, conductor, technical consultant and author, Sandroff specializes in the live performance of computer/electronic music and has realized, programmed or performed works by Alvin Lucier, Edwin London, Robert Lombardo, Steve Reich, Barney Childs, Matthew Malsky, Easly Blackwood, Morton Subotnik and Pierre Boulez and with CSO clarinetist John Bruce Yeh, is a member of the performing duo Double Dialogue. An acknowledged expert in analog and computer-based electronic music and audio systems, Sandroff regularly tours, performs lectures and consults on the design of academic and commercial electronic music systems. He has been guest composer at The Julliard School, Stanford University, Northwestern University, the Manhattan School of Music, the Capital Area Composers Consortium, Catholic University of America, Bennington College, State University of New York in Albany, Rennsilear Polytechnic Institute, Bowling Green State University, Queens College of the City University of New York, Catholic University, University of Texas, Princeton University, Kunitachi College of Music, Japan Saxophonist Association, the Grand Rapids Michigan Chamber Music Society, Marian College, the Institut de Recherche' et Coordination Acoustique/Musique (I.R.C.A.M. ), the Oberlin Conservatory of Music, The University of Oklahoma and the Aspen Music Festival. He has appeared as guest artist with the Santa Fe Opera, the Chicago Symphony Chamber Series, the Ojai Festival, I.S.C.M. Boston, the Grand Rapids Chamber Music Society and many others. His published articles on musical and technical topics have appeared in a variety of publications including the International Computer Music Conference Proceedings, New Ways: In Music Education and Electronic Musician Magazine. Sandroff is currently Director of the Computer Music Studio and Senior Lecturer in Music at The University of Chicago and Professor of Sound Art with the Radio/Sound Department of Columbia College. He is formerly Music Director and Conductor of Chicago's New Art Ensemble. 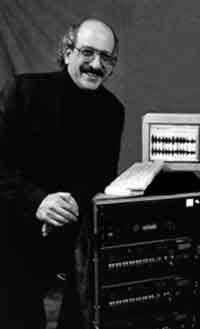 A Chicago native, Howard Sandroff received the Master of Music degree with Honors in Composition from the Chicago Musical College of Roosevelt University and completed advanced studies in computer music and audio systems at the Massachusetts Institute of Technology. His composition teachers have included Robert Lombardo and Ben Johnston. He has received composition fellowships from the National Endowment for the Arts, the Athena Foundation, the Illinois Arts Council, and research grants from Columbia College, Chicago Artists Abroad, The University of Chicago, the Yamaha Music Foundation and others.